My stay here is Kansas has been sweltering, but full of much needed and hugely appreciated quality time with my parents. I’ve also been able to act as the helpful daughter by working on a few things around the house while I’m here. Last week, I was excited to be able to celebrate my dad’s birthday in person for the first time in a long while. The three of us celebrated by going out for sushi and eating bite sized food with chopsticks from a 3-foot long wooden boat. And, of course, we laughed a lot. Then, a few days later I had the chance to treat him to a musical theater performance in Kansas City with just the two of us, which was very special. Due to my last minute travel plans and decision to stay with my parents for a few weeks after my granddaddy’s funeral, my Cinnamon Girl Cardigan is currently hibernating at home. It was just too bulky to bring along in my carry-on bag. It’s about 75% complete and fits like a charm so far. I managed to quickly snap some progress photos right before I left home. I still have the last few inches of the bottom to do and then the sleeves. Once I finish the hem of the skirt, the weight should pull down the cardigan a bit more, which will help the bodice line up with the bust better. I look forward to finishing the cardigan up when I get back. Socks seemed like the perfect project to stuff into my purse for my trip. So on the morning of my flight, I packed a set of bamboo double pointed needles (less likely to be confiscated by TSA) and a colorful skein of sock yarn by Yarnarchy, which was conveniently wound into a cake already, ready to knit. The colorway is called November and it’s sparkly and very happy. It was my hope that knitting with a special “treat” yarn would act as a small glimmering of colorful cheer in the midst of everything. I think I was right. In between flight delays, lack of sleep, stomach aches, and strong emotions, working on a pair of fun, happy looking socks helped me the tiniest of little bits to embrace the quiet moments. Since my sock knitting knowledge is fairly limited, I emailed a knitter friend to ask for some basic sock pattern recommendations. There are just so many sock pattern options out there, and I didn’t know where to start. Should I knit toe up, top down, one at a time, two at a time, with magic loop, with double pointed needles, with two circular needles? What type of heel should I knit? I remember knitting a pair of socks (or maybe just the majority of a pair of socks) a long time ago (college? 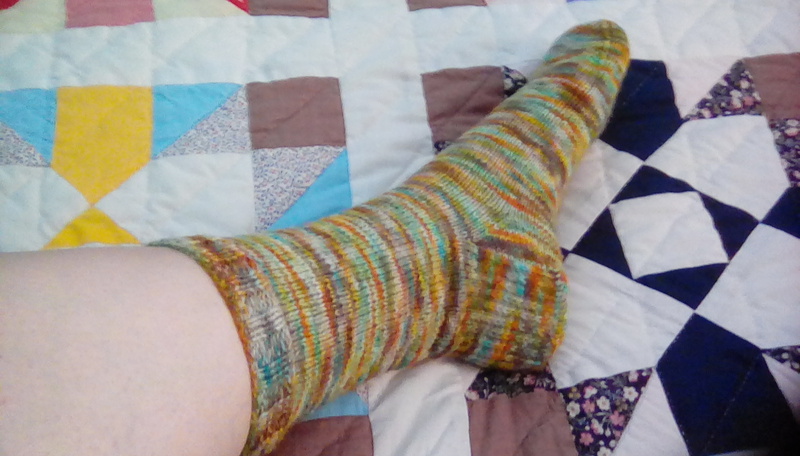 ), but I figured I’d try to find the most basic vanilla sock pattern possible to keep things simple. 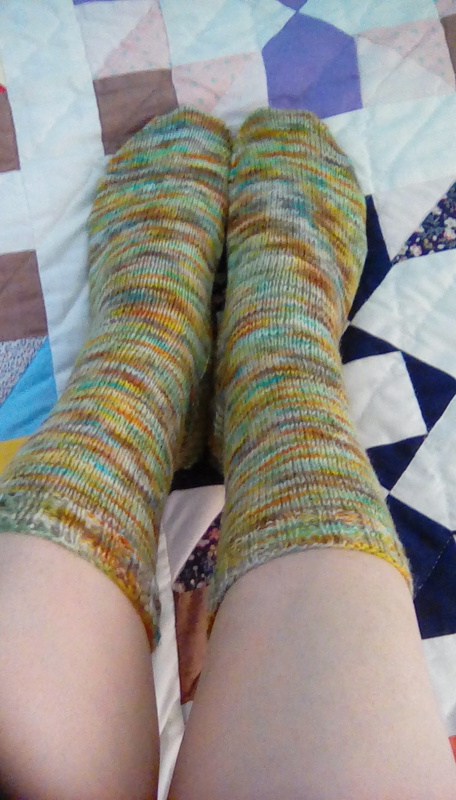 I decided to try out Susan B. Anderson’s “How I Make My Socks” pattern, which turned out to be exactly what I was looking for and easy to follow. 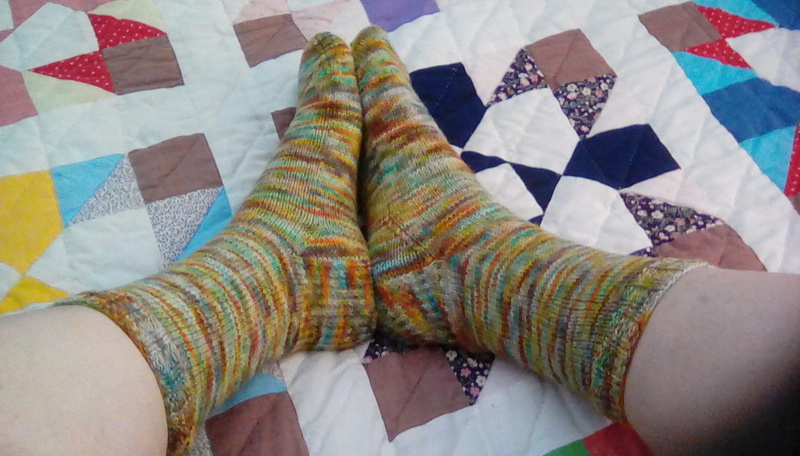 A little over a week after casting on the first sock, I have a new pair of fun socks! As part of my dad’s birthday gift I promised him a pair of completed socks before I leave. As of now I’m planning on staying a little while longer yet, so I should have plenty of time. 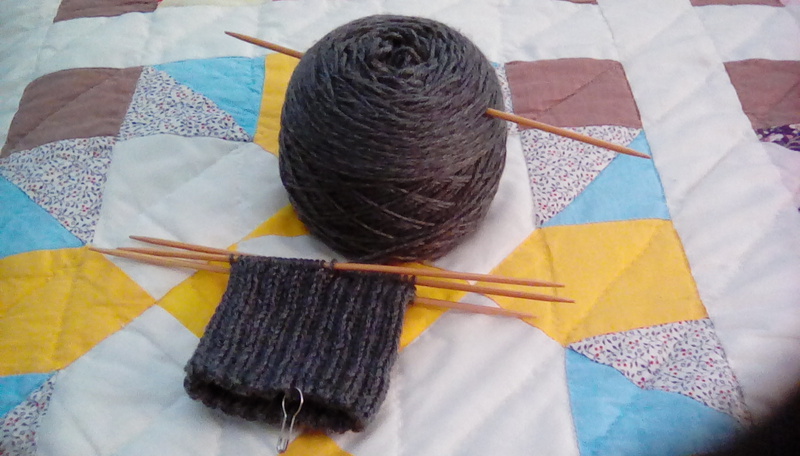 I just cast on the first ribbed sock a couple days ago. 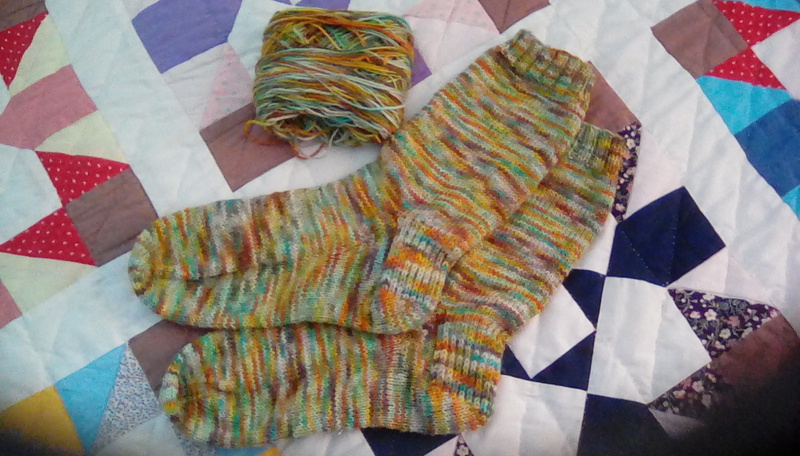 The yarn is Heritage Sock by Cascade Yarns, which is very squishy soft. These will be very cozy socks indeed. I picked up the new skein at Yak n’ Yarn in Topeka, which is a fairly new yarn shop. Before it opened the closest local yarn shop was Yarn Barn, which is about half an hour away in Lawrence. On a whim, I signed up and took a brief peg loom class a few days ago at Yak n’ Yarn, which I’ll post about a little later on.